This is Marlene from ScrappinCookie, Guest Designing for Jaded Blossom March 2018. I had SOO much fun last week during the Release playing with all the NEW stamps. 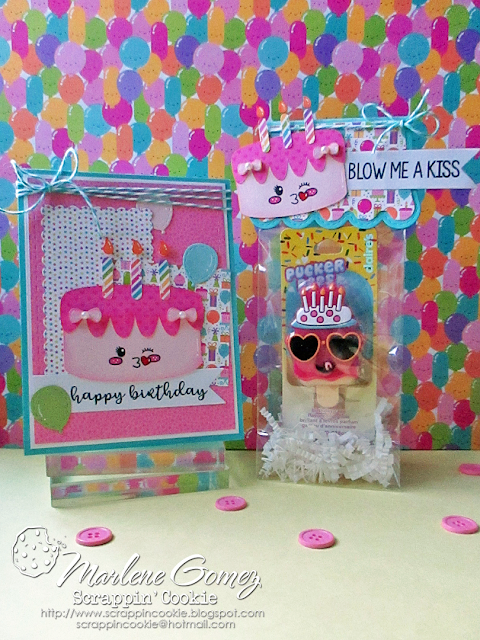 I'm back today showing you one more project using the Stamps and Dies released last week. I was at CVS the other day and found this adorable little Birthday Cake flavored Lip Gloss by Claire's - perfect for the March 2018 Release. I put it inside a Gusset Bag with some paper shreds and created a quick topper using the Jaded Blossom Scallop Slider & Topper Die. I used a Birthday Cake from SVG Cutting Files and gave it the NEW Sweet Faces. Used the "Blow Me A Kiss" sentiment from the NEW Jaded Blossom Flan-Tastic Stamp Set on a Jaded Blossom Flag Die. No Birthday Present is complete without a Birthday Card. So I put together a matching card using the Jaded Blossom Card Mat Dies and Scallop Rectangle Dies 2. 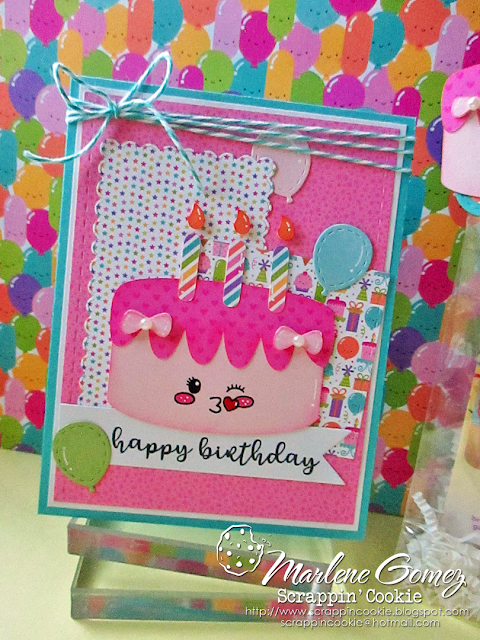 For the card, I used a "Happy Birthday" sentiment from the NEW Jaded Blossom So Many Birthdays 4 Stamp Set. 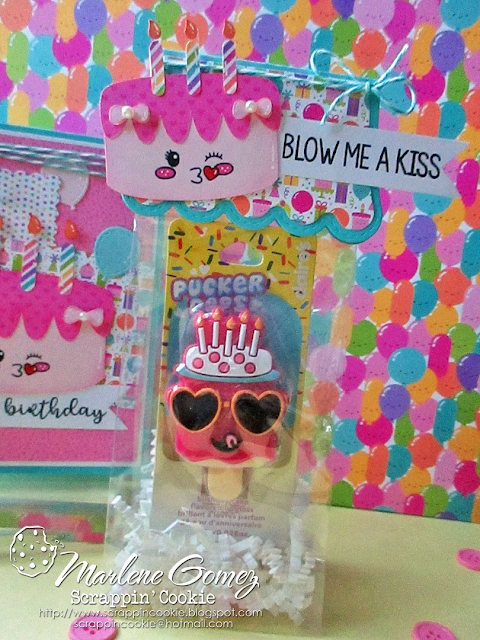 To finish off the card, I scattered a few balloons made with the NEW Balloon Dies. I hope you have liked my BLOW ME A KISS Birthday Set. Ooh, wow! What a great Birthday set... Love it! So So cute!!! Fabulous projects!! Super cute birthday set!! Awesome job! So cute and colorful - love the happy colors.